I recently went out to my friend John Harris’ country home in the Isumi district of Chiba Prefecture, about 100 kilometers southeast of Tokyo. His house is midway down the Pacific coast of the Boso Peninsula, close to the small town of Onjuku, which is known for its surfing and its (formerly) bare-breasted ama (female divers). John, who is a well-known speechwriter here in Japan, had invited several friends over to feast on the venison of Reeves’muntjac (Muntiacus reevesi), a small deer originating in China that’s one of 12 species in the genus Muntiacus that’s native to South Asia. These days muntjacs aren’t popular on the Boso Peninsula, where they have spread quickly ever since a few escaped from a zoo in the 1960s. In fact, lots of people, especially farmers, are asking what to do about them. Well, as I have eaten muntjac venison in my native Wales — where some animals also escaped from a zoo and went feral — I’ve never hesitated in my advice. As a result, John and his friends made several dishes using this delicately flavored meat, including pate, curry, grills, roasts and a spicy Thai feast— and all were excellent. 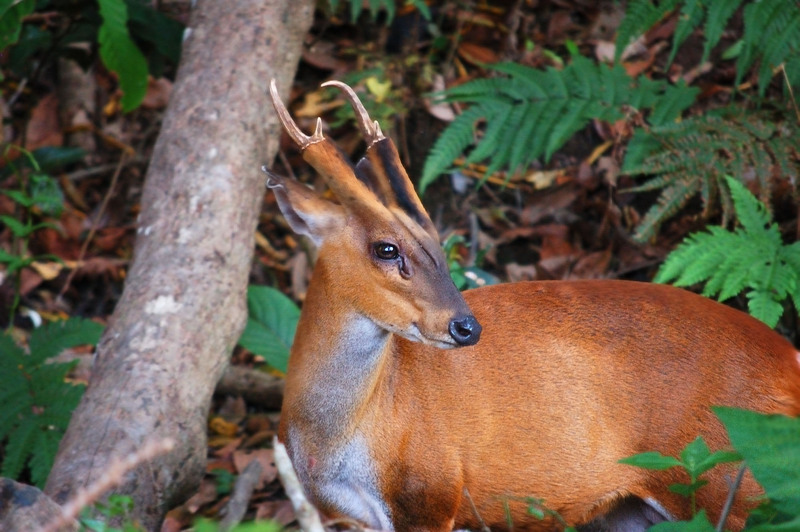 Reeves’ muntjacs are called “kyon” in Japanese, presumably because the word sounds like the sharp noise they make that’s given them their common name of “barking deer” in English. As the smallest of all the deer, they are about the size of an Irish Setter — weighing from 10 to 15 kilograms and standing about half a meter at the shoulder. Unlike Japanese sika deer, they don’t have any white spots on their brown coats, just black markings around the muzzle, while stags sport small, spiky antlers. 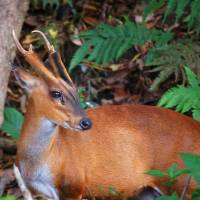 Muntjacs are very nimble and agile, and far more omnivorous than other deer. They will eat grasses, young green tree saplings, acorns, insects, frogs, shiitake mushrooms and apparently, if they get into your garden they just love pansies. Muntjac will also munch on tomatoes, watermelon flowers, bamboo sprouts, kiwi fruits, ashitaba (Angelica keiskei) and many other vegetables. Like all deer, muntjacs are wary, but if they feel safe they can become quite bold. When they escaped and began to widen their habitat on the Boso Peninsula, they first spread along the coast, feeling very much at home on steep, wooded slopes. Now they’re commonly spotted in gardens and will forage during daytime. Muntjacs reach maturity just after they are 1 year old, and will mate at any time, with does bearing one young every year. As they are very adaptable and there’s lots to eat in the area, with hardly any hunters going after them, it’s no surprise they are now regarded as a pest. Actually, a local biologist told me there are at least 50,000 in Chiba, and they’ve been spotted in adjoining Ibaraki Prefecture as well. So unless serious steps are taken to bring the numbers down, I predict their population will double in about four years. Years ago I was first given muntjac venison by a park ranger in Wales, whose job it was to research and control the deer in the national park where he worked. Now the meat is available online in Britain — as it could be in Japan. I’ve hunted and filmed hunts for red deer, fallow deer, moose and caribou, but never the little muntjac. It would seem to me that a smaller caliber rifle or a 20-gauge shotgun using rifled or sabot slugs might be the best way to go, although many Japanese hunters use buckshot. Personally, I prefer my dinner mildly peppered, not peppered with pellets. Once, in Finland, I went on a moose hunt in which hunters with dogs drove them out of the woods, where they could be shot with rifles. It was very effective, and one hunt provided a whole village with meat. With Japan’s dense woods and steep slopes, a different way would probably have to be used, perhaps getting dogs to drive them into netted enclosures — a method I have seen used for the big Ezo deer in Hokkaido. 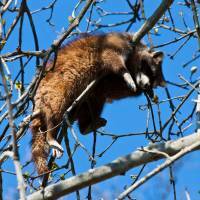 Meanwhile, muntjacs aren’t the only invasive species on the Boso Peninsula, with raccoons and masked palm civets flourishing there, too. After the 1963 release of “Rascal,” a children’s book by U.S. author Sterling North about his childhood adventures with a cute and mischievous pet raccoon, a 1977 TV anime series it inspired in Japan started a craze that led to 1,500 of the North American animals being imported every month. 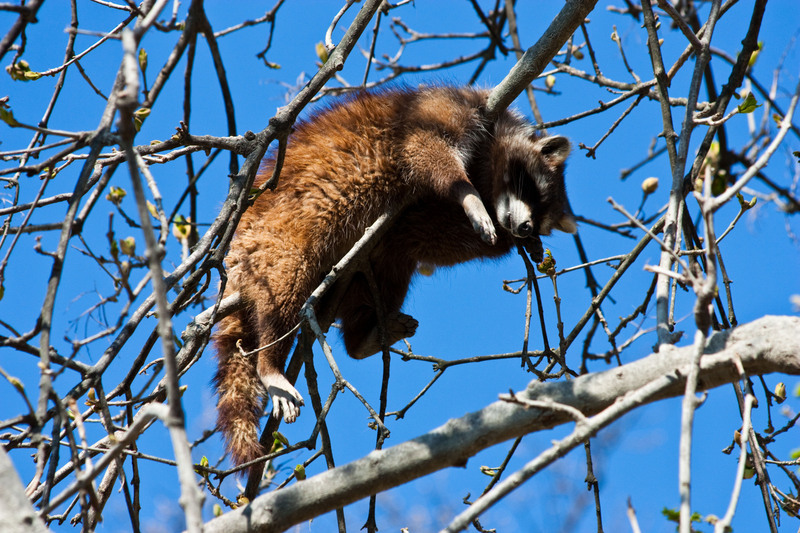 Although the trade was quickly banned, the damage was done and raccoons have now gone feral in 42 of the country’s 47 prefectures. There is some confusion over civets, but experts I know have told me they were imported for their fur more than 100 years ago. Yet now they are even quite common in our Afan woods here in the north of Nagano Prefecture — and this is snow country, where we don’t grow palms!